the scent of green bananas: fresh start. Posted by santos. This entry was posted on 20090203 at 4:54 PM You can skip to the end and leave a response. 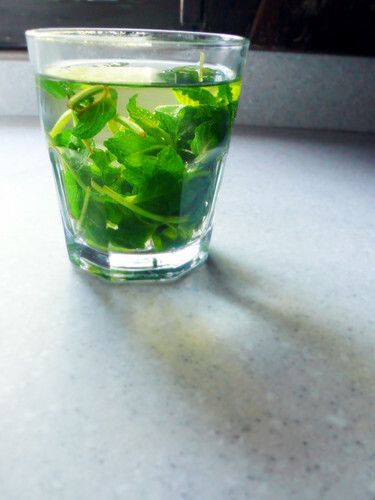 This glass of mint infusion is lovely, and must be tasty too. I love that! [blows one rightbackatya] now for the serious comment... i love fresh mint tea with a hunk of overly sweet, cloying baklava, persian style. botacook, easy to make, easy to take. try it sometime! akatsukira, can't take the glib back now, honey. where's my baklava! Hey, the salad in the first photo looks great!